Dry ginger powder (sukku podi) - 1/4 tsp. Cardamom powdered - 1/4 tsp. Chopped coconuts - 2 tsp. Fry the coconut pieces in ghee. Mix all the ingredients well. Add water little by little and whisk well to form a batter. The batter consistency should be semi thick(not too thin or too thick). Keep aside for 2 to 3 hrs. Heat a paniyaram mould, drop in a spoon of ghee and pour the batter in each dent, little more than 3/4th. Simmer the stove, cook covred for 2 minutes, turn to the other side and fry unitl golden brown. TIPS: Adding curd gives the airy holes and soft appams. NOTE: Millets flour are available at stores. Alternatively you can mix 1/4 kg.each of any millets of your choice and grind to a flour in a flour mill. 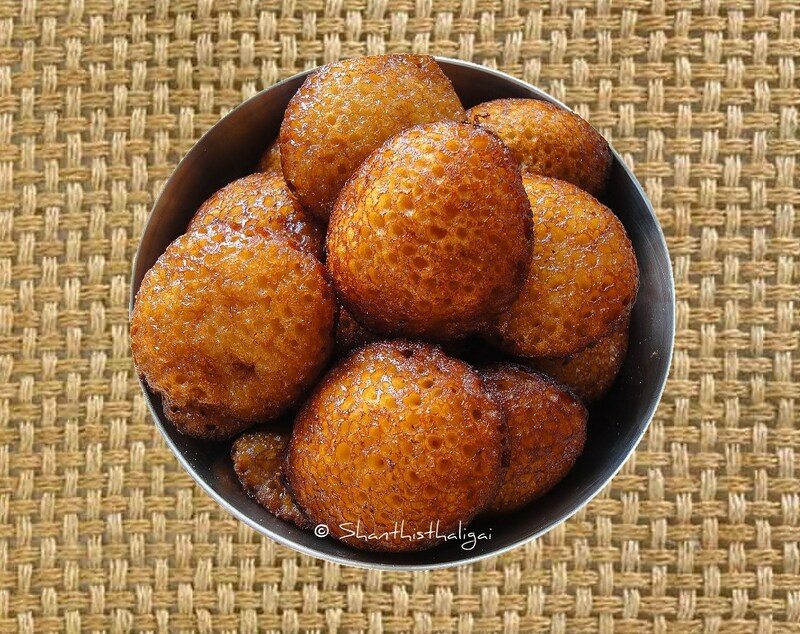 Millets sweet appam looks so delicious and mouthwatering. Wonderfull preparation. Yum Yum dish. Love it. Thank u for sharing the recipe. I can't take the print out of your recipe. Would you please make your recipe available to print?